Our US servicemen and women work hard and sacrifice so much for us overseas. Through the United States Postal Service, we are able to provide the same standard shipping & ground rates to APO & FPO addresses as we would with any domestic US address. 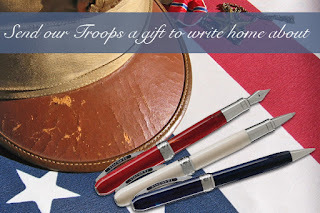 That means we can ship pens and other accessories by US Priority Mail starting at $6.95, with refills going by US First Class starting at $3.25. Both starting rates are for the first five items of the order. We will also honor free shipping promotion codes that usually apply to continental US - on orders that are placed with an APO/FPO address. Priority mail may not show up as an option on the list of shipping methods when checking out. If this happens, simply select UPS ground for the same price and we will ensure the package is sent properly. Use the service member's full name - mail must be addressed to someone specific. Pictured in this post are the Visconti Rembrandt pens available in Red, Ivory and Blue. If you need any assistance placing an order that is being shipped to an APO / FPO address, please feel free to give us a call during our office hours at 800-963-PENS.